The massive mixed-use development slated for the block surrounding the Chronicle building at 5th and Mission, dubbed 5M, appears to be moving forward despite some controversy, and today we get word that Jane Kim has pledged her approval now the developer Forest City has agreed to build 40 percent of its residential units as below market rate. 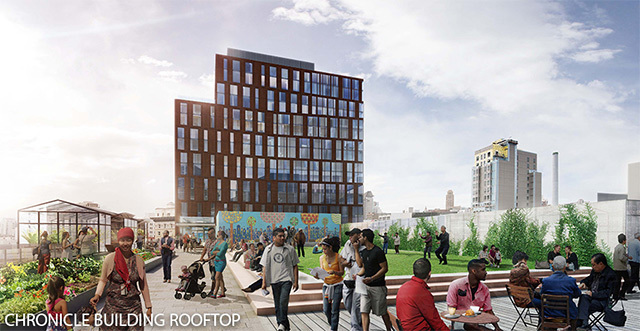 That's up from the previously pledged 33 percent, and will mean that the project will include 241 affordable units. As Kim says in a statement, "40 is the new 30 when it comes to affordable housing whether you’re building on public or private land," noting that she negotiated the 40 percent affordability level for the Giants' mixed-use project at Mission Rock too. The project was set to go before the Board of Supervisors' Land Use & Transportation Committee Monday afternoon, and this follows on its approval by Planning in September in a slightly different form, with fewer affordable units. The sheer size of the complex, with a mix of office and luxury condos, caused some consternation in the neighborhood, with some community groups pledging to appeal its approvals last month, and Kim joining them in their objections. But it now looks like it could sail through further approvals, with Forest City now committing to building 87 middle-income, BMR units onsite in what's called the M2 building. This is in addition to 83 units of senior housing to be built on a separate site, and a 100-percent affordable family housing building, with 103 rental units at 168-186 Eddy Family Housing, 71 of which will be subsidized by the developer. Kim's approval comes in part, it looks like, from the developer's pledge to build the 87 middle-income units on site, which will be available to SF residents making 100 to 150 percent of the AMI, and will be a mix of studios, one-, and two-bedroom units. As noted before, the project will also include a 470-foot-high luxury condo tower containing 400 market-rate units, and two 400-foot high Class A office towers facing Howard Street. There will also be new public open spaces, including on the roof of the existing Chronicle building, and rehabilitation work on several onsite historic structures.